Happy Monday, friends! Spring is just around the corner, and this week I am joining a group of sweet blogging friends to bring you our spring tables. This wonderful party is being hosted by the talented Chloe at Celebrate and Decorate. A schedule of this week’s tables are posted at the end of this post. Being exhausted by a colorless winter, color was my inspiration for this table. The underpinning for the table provides a wonderful backdrop with lots of pretty spring color. Coral roses lend the perfect pop of color to this table and tie back beautifully to the coral rose napkin rings. It’s a little known fact that coral roses are one of my favorites. The blue glass vase housing the roses actually belonged to my great-great aunt. Each place setting consists of a scalloped gold charger plate topped with a casual blue plate accented by my Grandmother’s blue floral china. At each place setting, you will find a pretty pastel egg perched in an American Fostoria glass. Did you spot the treats placed throughout the table? I have a weakness for macaroons. Trader Joe’s just so happens to have imported French macaroons that are quite delicious. It was awfully difficult to keep some little hands and big hands out of the jelly beans while photographing this table. Most of the sweet treats are placed in my Great Grandmother’s Depression glass. She had quite a collection. Thanks so much for your visits today, and be sure to visit the other ladies on the tour. I am sure that you will find lots of inspiration for your spring entertaining. Shannon, what a beautiful table with the coral roses. The coral and blue are perfect springtime colors. I love that your table is full of sweet memories of loved ones! I also love macarons and often buy Trader Joe’s! I even took a macaron cooking class. Beautifully presented Tablescape, sweet friend! Lovely, Shannon! Here in Northern Italy this winter seems endless this year… I perfectly understand your need of colors! Shannon you have created a beautiful tablescape to celebrate the arrival of spring. The coral roses in the blue vase is so striking! I especially love the tablecloth and how you have used heirloom pieces throughout! So vibrant for spring, the coral and blue are so pretty together. I like seeing your depression glass collection, I have a fair amount of that too. Shannon, your table is beautiful. You’re so fortunate to have your grandmother’s things for tablescaping. Those are the things collectors like me covet, always searching for the elusive treasures never handed down when on the hunt in antique stores, estate sales and auctions. Your table is beautiful, and it all ties so well together with the cloth, the flowers and place settings. I love that you use your things handed down, they make beautiful tables, and your style reflects it. ps – It’s hard to keep hands out of bowls of candy in our house, too. I can’t even count the number of bags of jelly beans we’ve gone through since the day after Valentine’s, when we first saw them. And we don’t have little hands in our household – no excuses! I love this elegant Spring table! Happy Easter!! So gorgeous Shannon! I love the texture and pattern that you used with the tablecloth and the dinner plates. They look like they were made for each other! Spring is bursting our all over your table Shannon! I am crazy about the blooming napkin rings and the very special blue vase with coral roses are the perfect color pop! It is all so bright and fresh! I will be by later for a colorful macaroon! How pretty! I love the coral and blue together. Love your tablescape Shannon….so pretty and I envy you a Trader Joes so close and convenient. Mine is located about 30 some miles from me. :(…so I don’t get to it that often. I adore depression glass and collect different patterns, yours is beautiful and the tablecloth ties it all together. It is always a pleasure to table hot with you. Blessings. Shannon, how special to have your grandmother’s coral plates and depression glass. They add so much in color and meaning to your tablescape. Thanks for the heads up about Trader Joe’s having macarons. I love French macarons and it’s nice to have another resource. Shannon, your entire table is elegant, but, your plate stack is the icing on the cake! I could just stare at your plate stack and swoon. It is so wonderfully elegant! The deep coral of the roses is a nice pop on your tablescape! 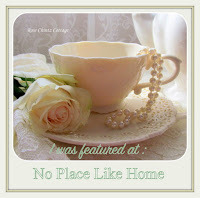 Thank you once again for being a part of another tablescape blog hop! I am a tablecloth lover and this tablecloth speaks to me! All of the elements on your sophisticated table just draw me. Such richness and layering. Oh how love the roses and china! Shannon, Your table is lovely. Your grandmother’s china is so pretty and I do know a treasure to you. Things that have been passed down to us always provide such love and memories. I also love your color selections and linens, they are such happy colors of spring. Also, your dining room chairs are gorgeous. I enjoy them every time I see them. Hope you are beginning to see signs of spring in your area. A beautiful table! I love the table linen in particular and the depression glass. A great job! I love the color palette and the underpinning is gorgeous. Hopefully, we’re in store for some colorful and sunny days ahead! You did a wonderful job of pulling out the blue and coral from that very pretty table cloth and highlighting it with your flowers and placesettings. Your mix of precious pieces from your family is gorgeous, making for a very elegant table. Happy Spring! Shannon, I apologize for commenting so late but I have been traveling. I tried commenting on my iPad but got a motion sickness so I had to wait. I love your spring tablescape with such pretty colors. Your floral cloth is the perfect underpinning for your beautiful coral roses and lovely china. To have cherished pieces from your relatives is special and meaningful. Adding seasonal candy certainly entertains and your cute Easter eggs and floral napkin rings pull all your elements together nicely. Lovely table. Very pretty Shannon. Love the roses- great color pop for sure! I like the highlights of blue also and the pretty tablecloth. It’s been too long of a winter here and still white. I think it will be gone before long and then we can focus on spring all the way! Gorgeous, Shannon! Those coral roses are just incredible – so vibrant and pretty! I love how they pull the color out of the tablecloth and the contrast against the blue. Beautiful job! There is something so rich about the contrasting colors of blue and orange in your tablescape. Your tablecloth pulls everything together and sets the entire table as elegant and yet cheerful for Spring. The use of fresh roses on the table really is an eye-catcher. Your gold chargers are exquisite. A great combination of Spring and classic elegance together. Lovely, Shannon! Have a Happy Easter as you dine around your elegant table. Every detail is delightful. Beautiful table. And, oh my goodness, I have those same American Fostoria glasses that you show sitting on the plates, they were my grandmother’s – I never thought to put anything but juice in them! But they make darling egg cups and I’m going to copy this idea. Happy spring, happy Easter! Shannon…the table is so beautiful and so very special as you so beautifully incorporated your family heirlooms. Such great attention to detail and the colors are truly like a burst of Spring….I have parted with most of my Depression Glass; however, kept my American Fostoria as it is such a classic. Happy Spring Shannon! Color improves everything and used well there can never be too much. It’s nice to see that you treasure your heirlooms. To me, using what is left behind is a way of keeping loved ones alive. Wow! Love all the corals and blues, and how it plays off your China hutch in the background. So pretty for Spring! I love the beautiful colors in your Spring Tablescape! The dishes are gorgeous and the egg cups complete it perfectly! How wonderful to have family treasures displayed on your table! Macarons are my favorite! But those chargers are my favorite!